Grab your BeagleBone and connect it to your computer through a Mini USB cable. After the board boots up, open your web browser, and type 192.168.7.2:3000 in the address bar. You see something similar to this screen when the page loads. You can also access the Cloud 9 IDE via Ethernet. Power up your BeagleBone, and connect an Ethernet cable from your BeagleBone to your router. Open your web browser, and type beaglebone:3000. If you’ve changed your hostname, in your web browser’s address bar, type <yourhostname>:3000. 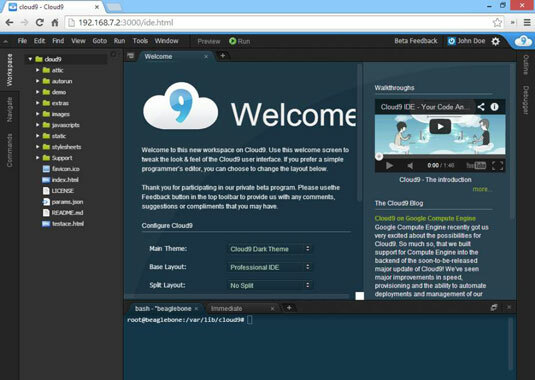 When you open the Cloud9 IDE for the first time, you may feel intimidated. There are so many menus, submenus, options, and tabs! To get started with your first project, you need to know about only a few of the windows of the Cloud9 IDE. File menu commands create, open, save, and close files. Edit menu commands give you the option to undo or redo a task, as well as cut, copy, paste, and edit your files. You can use the typical Ctrl or Cmd key shortcuts with these tools. Find menu commands make it easy to find or replace words in your code. 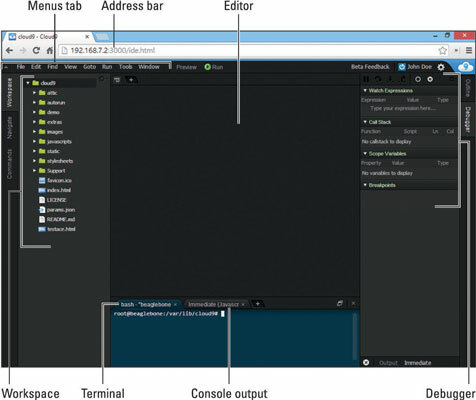 View menu commands allow you to change the look and feel of your editor window. Goto menu commands provide fast ways to access the right file. Run menu commands are used to run and build your scripts. Tools menu commands are used to format your code, rename variables, and play macros. Window menu commands enable you to select the windows you want to open or close. You can access all your folders and files with the workspace window. Just like in your computer’s file system, everything is organized in a hierarchy. You can drag and drop to move files, and creating folders and files is quite easy. The first time you open the Cloud9 IDE, the Preferences tab is open in the editor window. You can close that tab because by default, Cloud9 is preconfigured. The editor window is where you write all your code. The editor highlights the functions according to the syntax of the programming of the file you have open, which is decided by its file extension. The debugger is the perfect way to see exactly what is happening when you run your scripts. You can create a breakpoint so that your code runs only to a certain line that you define. You can also see which functions your code is calling and which values are stored in your variables. Terminal allows you to run commands. You can control your BeagleBone directly from the web browser, meaning that you can update or install new software, move files, and perform other commands. By default, you’re logged in as root, so you have full access to all commands that can be performed on your board. Be careful when you are logged in as root! As the administrator — or, as the Linux community usually calls it, superuser — you have the permissions to execute commands that would actually mess up the BeagleBone.